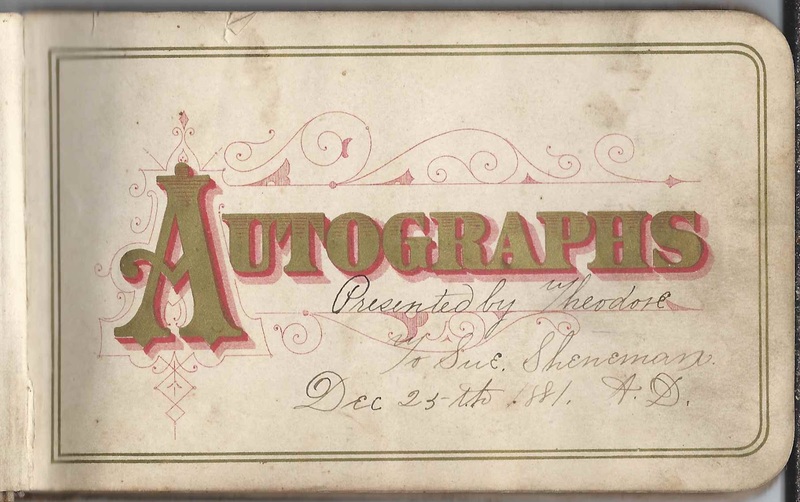 1880s autograph album of Susan Sheneman, "Susie", of Chester County, Pennsylvania. 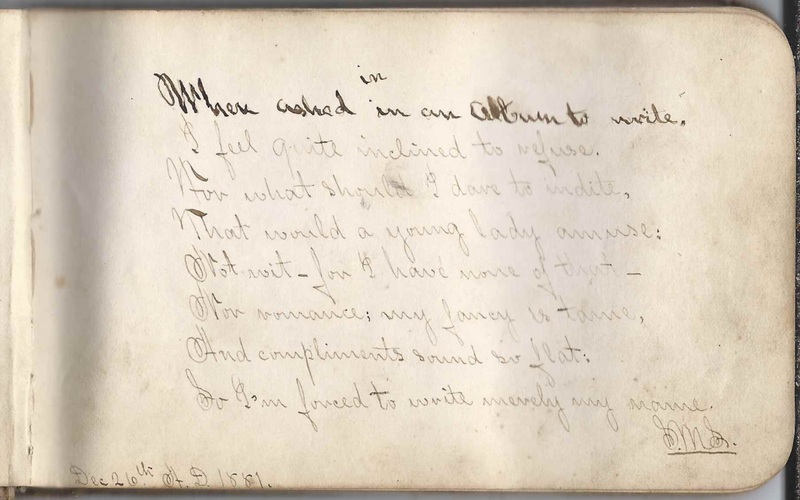 A few pages are inscribed beyond the era of the 1880s, a couple by her daughters. 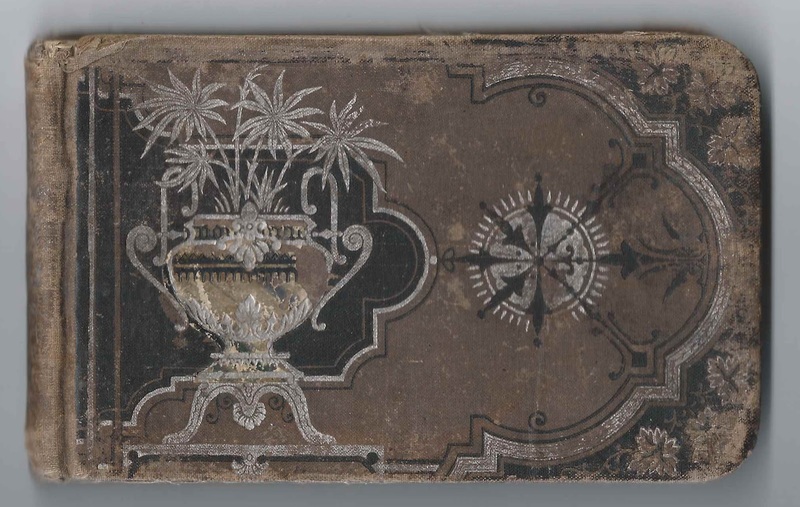 Research would indicate that Susie had died by the time at least some of these pages were inscribed, so perhaps her family was attempting to keep her memory alive. 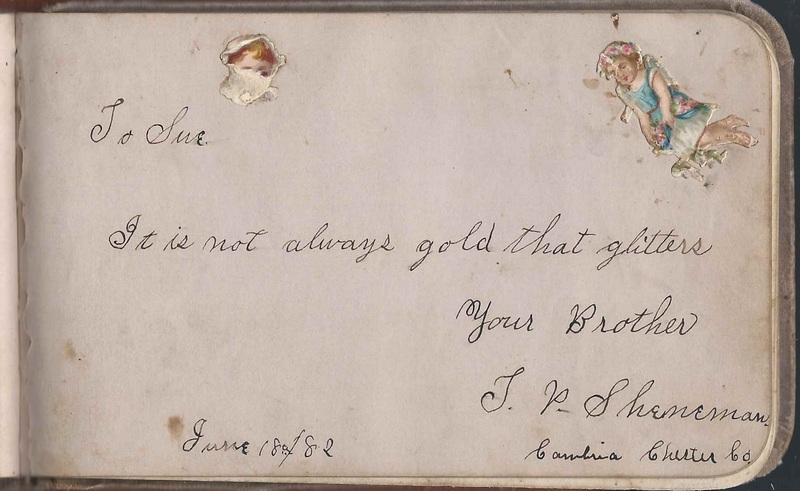 Susie's older brother, Theodore P. Sheneman presented the album to her at Christmas in 1881. Theodore signed a page later on in the album, as well. Susie herself inscribed a page to the people would be signing in her album. 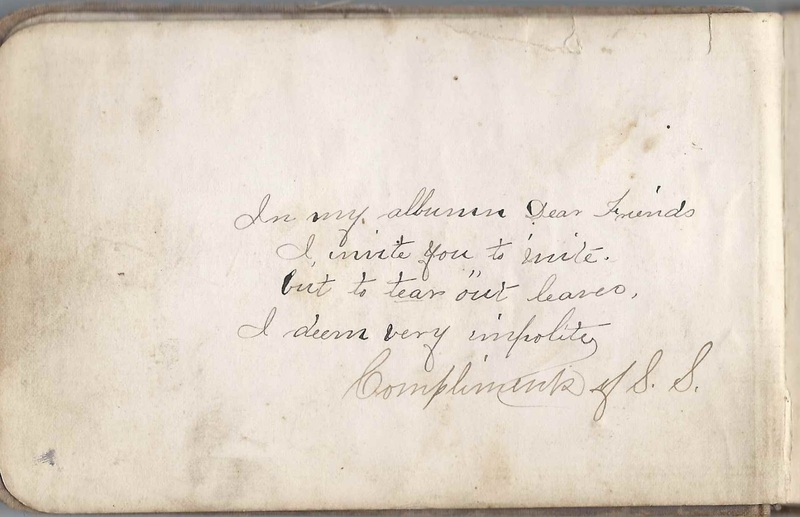 Bessie Sheneman wrote on the inside front cover. I don't know who Bessie was, and I don't know which era in which she signed. Susie had an older sister named Emma E. Sheneman, but she had died by the time Susie acquired her album. Susan Sheneman was born 11 April 1867 in Pennsylvania, the daughter of John and Margaret (March) Sheneman. From what I could tell, she was the youngest of seven siblings, two of whom were the above-mentioned Theodore P. Sheneman and Samuel Milton Sheneman, who may have been the S.M.S. who signed two pages in the album with his distinctive handwriting. On 11 March 1884 at Reading, Pennsylvania, Susan Sheneman married Mordecai Lewis DeHaven, "Lewis", son of Mordecai and Elizabeth C. (Smith) DeHaven. Lewis was born about May 1859 in Pennsylvania. 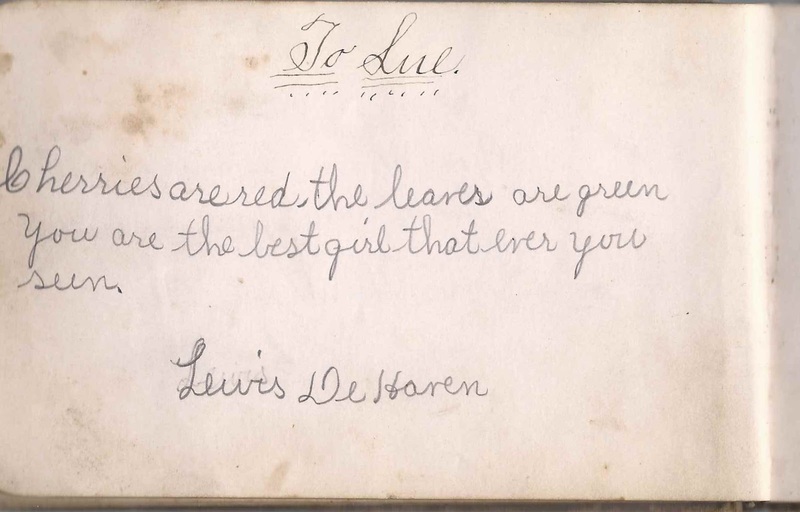 Lewis inscribed two pages in Susie's album, one likely before their marriage and one, on the inside back cover, after. The couple had at least two daughters and possibly a son Harvey, before Susie died on 22 January 1897. 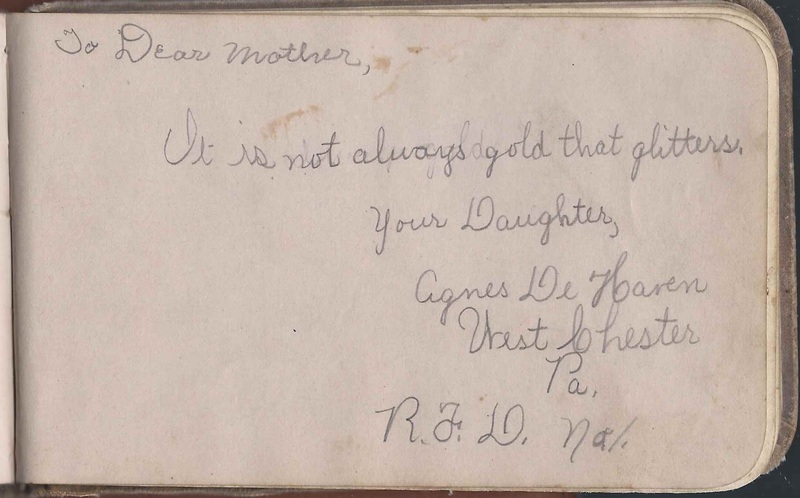 Daughter Agnes Clara DeHaven, who was born about September 1891, two pages in her mother's album, one of them on February 8, 1898 "In Remembrance". The page signed by Lizzie DeHaven of West Chester, Pennsylvania, on January 10, 1901, is a puzzler. I'm wondering if Lizzie was Susie's daughter from before her marriage to Lewis or a foster daughter to the couple. She may have been the Elizabeth Weer who became the second wife of Mordecai Lewis DeHaven about 1900. Elizabeth was born 11 February 1879 and died 11 September 1931. Lewis had predeceased her in 1918. Initials, the last of which is definitely S. The first two might be J.E., or I. E., or J. C. or I. C. or ? Annie B. Cooper, signed on "1/10/82"
Marriott C. Cooper of Lionville, Pennsylvania, signed on April 6, 1882. Presumably Marriott Canby Cooper, who went on to live in Indiana and California. 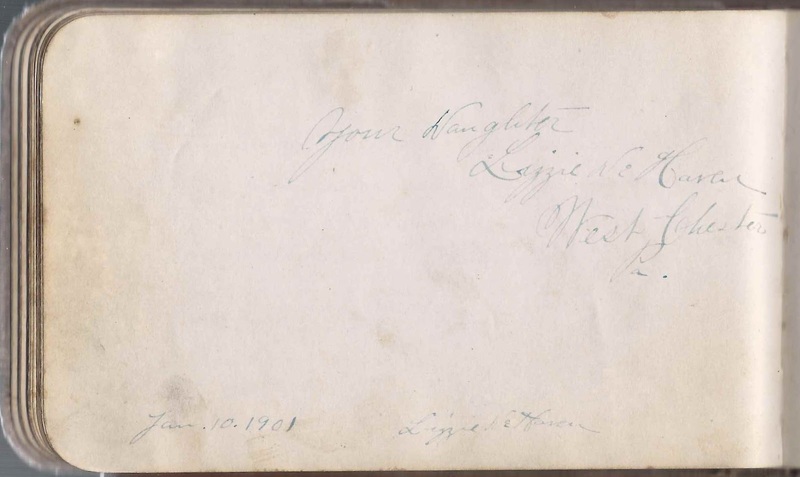 He wrote "butcher boy" and "cow boy" on the page, in addition to his sentiment. F. Thomas Cooper of Lionville, Pennsylvania, signed on "4/5x.82". 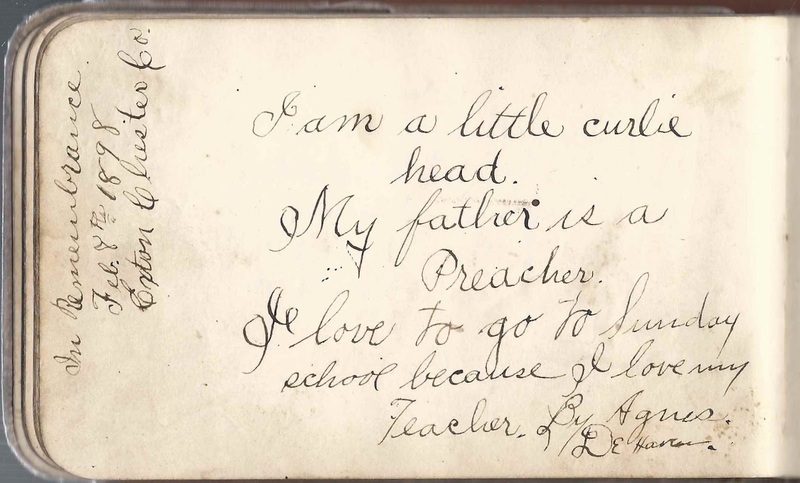 He wrote "butcher boy" on the page in addition to his sentiment. Lewis DeHaven; Mordecai Lewis DeHaven, Susie's future husband. "Remember me dear Susie when on these lines you look. Remember It was Lewis who wrote this in your book. L. M. DeHaven to wife". Lizzie DeHaven of West Chester, Pennsylvania, signed on January 10, 1901; "your daughter". This would have been written after Susie's death in 1897. W. Y. Emery, signed on March 18, 1882. "Think of me when in a distance country you stray. Paying your board on a ship bound for Chesapeake Bay." 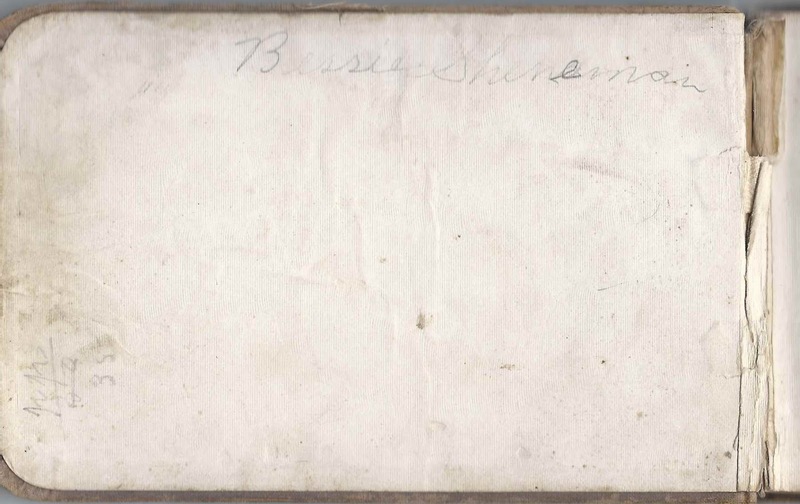 Bessie Sheneman - name written on inside front cover. Not sure who she was. Susie had an older sister, Emma E. Sheneman, who died in 1880, before the album purchased, unless the Find-a-Grave record is in error. 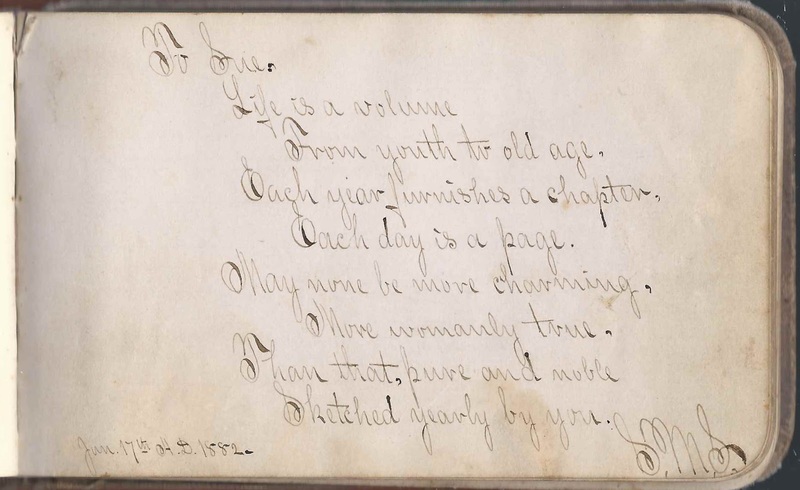 Susie Sheneman dedicated this page to the future signers in her album. S. M. S., signed on December 26, 1881; presumably Samuel Milton Sheneman, Susie's older brother, who signed another page on June 17, 1882. 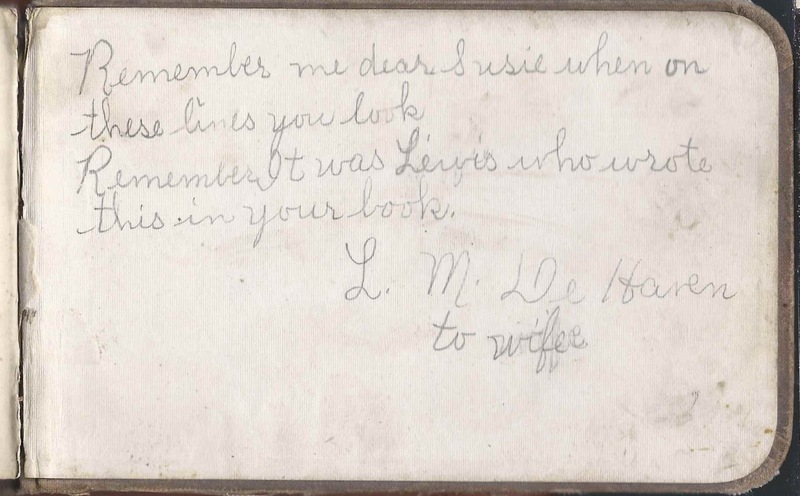 Annie E. Steen, signed at Lionville, Pennsylvania, on January 10; Susie's schoolmate. Later on, someone wrote: "In Remembrance"
S. Tyson, signed at Howellville, on "4/8/83"